Construction of the Dakota Access Pipeline in South Dakota. Few elections in recent memory have provoked the depth of animosity and controversy as the presidential election of 2016 between Republican candidate Donald Trump and Democratic candidate Hillary Clinton. Many positions represent polar opposites and this has been especially true of anything relating to environmental topics, such as climate change and the world of petroleum transportation, specifically including pipelines. Within that last sentence, we find one of the most controversial of all matters, the proposed, but recently rejected, application to build the Keystone XL pipeline. 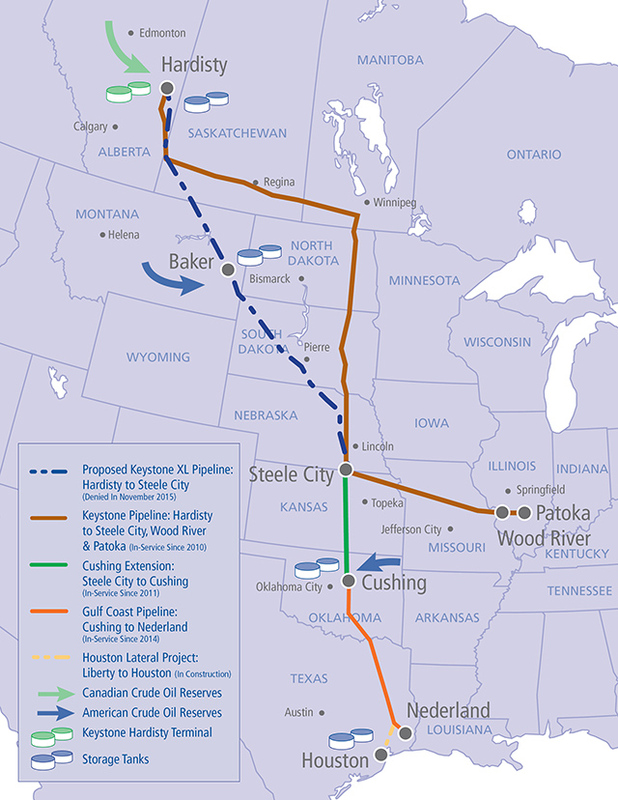 Keystone XL is the proposed pipeline extending 1,200 miles (about 2,000 kilometers) from the prolific oil sands of Alberta to Steele City, Nebraska where it would join up with existing pipelines for transport to major refineries and Gulf of Mexico shipping ports. The pipeline would carry about 830,000 barrels of petroleum per day and would be constructed by TransCanada Corp. Financing would be provided by that corporation and refineries and oil shipping companies which would be recipients of the end product. The matter is of vital importance to two particular petroleum-producing regions whose economies having previously prospered mightily through oil and natural gas exploration, development and production. The two regions are the provinces of Alberta and Saskatchewan, plus the oil-rich areas of western North Dakota, particularly including the Bakken oilfields. In each case, these regions produce petroleum far in excess of their area’s domestic consumption and therefore are heavily dependent on transporting that excess production to various markets. Few alternatives other than pipelines are available to accomplish the necessary transportation functions. Both regions are land-locked, and therefore marine tankers are not possible. Given the quantities of petroleum involved, trucking is a non-starter and shipment via lengthy rail tanker trains has been heavily condemned by environmental and safety experts. 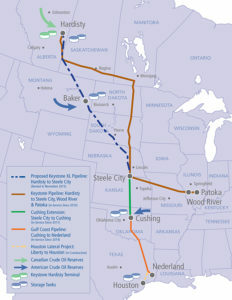 Some of the strongest arguments for the project come from economists and those politicians who are strong advocates for approval of Keystone XL, as they claim it would result in 42,000 jobs during construction, and completion of the project would permit continued expansion of petroleum exploration and production in both regions. However, consistently strong opposition to Keystone XL has arisen among those opposed to the project’s approval. Those anti-Keystone XL forces have brought forth several important points with their arguments being a primary factor in President Obama’s decision to ‘veto’ the project – and it is the vast differences between the two groups and the fact that the two current presidential candidates have advocated diametrically opposite positions that has raised Keystone XL into a raging hot topic in this years’ campaigns. Former Secretary of State Clinton is siding strongly with her party’s general support of the environmental community’s hostility to Keystone XL. In a detailed statement posted on her Hillary for America website, Clinton offered several points including, “Since the application was filed, the effects of climate change have grown more acute”; “We shouldn’t be building a pipeline dedicated to moving North America’s dirtiest fuel through our communities”; and “Building a clean, secure, and affordable North American energy future is bigger than Keystone XL or any other single project”. She also indicates strong support for strengthening the body of national pipeline safety regulations. In addition, Hillary has sided with environmentalists on other topics such as the recent Paris UN climate accord; opposition to fracking as a means of oil recovery; plus extensive research and expenditures to promote ‘alternative, non-polluting and renewable’ sources of energy. For his part, candidate Trump has used the Keystone XL debate as a means of promoting his general political and economic philosophies. He is generally against what he regards as over-regulation and would not only immediately approve a renewed Keystone XL application, but would also simplify the entire pipeline application process. He would end support for the Paris climate accord. He would ignore environmentalists’ warnings about Canadian tar sands oil being particularly ‘dirty’, and would in fact encourage further tar sands development as part of an American energy-independence strategy. And, as a particular insult to the political Left, he adamantly continues to declare that the entire global warming concept is simply “an expensive hoax”, and the American Environmental Protection Agency (EPA) as being “an impediment to both growth and jobs”. Simply put, Hillary has declared President Obama’s rejection of the Keystone XL project as being “the right call!”. On the other hand, Trump openly declared that if he is elected president, TransCanada should file a new application and he would, “absolutely approve it, 100 percent!”. It is hard to get starker differences than those – and the political, petroleum, environmental and economic communities await, sometimes eagerly, sometimes with trepidation, for the results of American voters’ decisions of Tuesday, November 8, 2016.